After having conducted a series of consultations with Canadian consumers on ways to improve nutritional labelling on food packaging, Health Canada undertook a broad review of the food labelling regulations. Several regulatory updates are proposed to enhance nutritional labelling, as well as the declaration of ingredients, allergens and bio-active compounds added to food (e.g. caffeine). 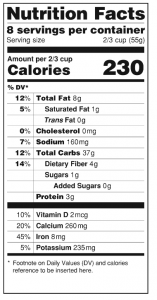 What to Expect Regarding the Display of the Nutrition Facts Table? 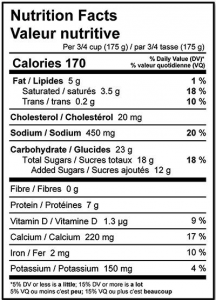 This article describes the modifications proposed by Health Canada with respect to the presentation of the Nutrition Facts table. Regulatory modifications related to elements within the Nutrition Facts table (declared serving size, nutrients, daily values) and modifications related to the ingredient and allergen declarations will be discussed in separate articles. 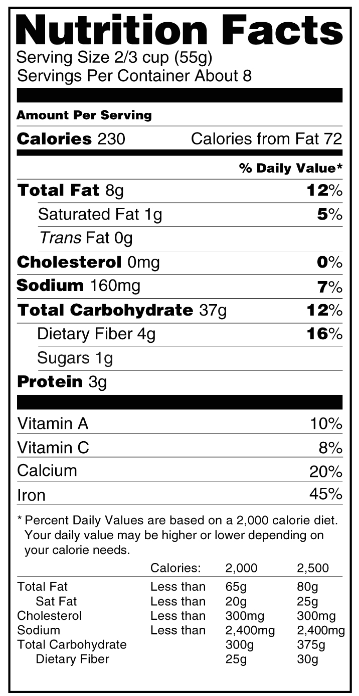 The figure below illustrates the current Nutrition Facts table versus the proposed new version. It is followed by a commentary of the new features, as perceived by ACC Label’s nutritionists and expert advisors in food labelling. What do ACC Label’s nutritionists think about the proposed regulatory changes? Overall, the changes proposed by Health Canada should make the NFT easier to understand for the consumer. The proposed table contains more information and is visually better organized. The inclusion of the added sugar content is still uncertain. ACC Label’s nutritionists believe this information may help consumers select foods containing less refined sugars. However, ACC Label nutritionists foresee challenges for food manufacturers in obtaining the added sugar content of certain ingredients and therefore of finished products. The table below describes the pros and cons of each of the Nutrition Facts table display feature that Health Canada proposes to change. The table also includes the opinions of ACC Label’s expert advisors. Aligns serving size with % DV, thus improving eye flow across information. In favor. Sub-Heading “Amount/Teneur” In favor since these sub- headings were not necessary. global nutritional value of the food product. This is also the opinion of the Quebec dietetic association, l’Ordre professionnel des diététistes du Québec. For example, a glass of 250 ml of partly skimmed milk with 130 Calories is nutrient-rich compared to the same amount of cola drink with 100 or even zero Calories. Calories should not appear more prominently than nutrients. get enough are grouped below a thick line, in the bottom half of the NFT. To facilitate consumer understanding of the nutrient grouping concept, perhaps the new NFT should include sub-headings (e.g. “Avoid too much of” and “Get enough of”), as proposed for the new US Nutrition Facts panel (see figure 3). Carbohydrates are grouped with the nutrients which consumption should be limited. However, according to the Institute of Medicine, carbohydrates should constitute 45% to 65% of one’s total caloric intake. Sugars should stand alone (or be grouped with sugar alcohols, if declared), below sodium and above the thick line separating them from carbohydrates and fibre. Declaration of dietary fibre near other carbohydrates, but separated from them with a thick line. The position of fibre in the proposed NFT is strategic. Listing fibre immediately below other carbohydrates and sugars helps people with diabetes, and on insulin therapy, to adjust their insulin dose requirements on their carbohydrate intake. Grouping fibre with nutrients which increased consumption is recommended may help Canadians realize that they should consume enough fibre. Of course, it will have to be made clear to the consumer what each nutrient group represents, i.e. nutrients to limit consumption in the top half of the NFT, and nutrients to get enough of in the bottom half of the NFT. In this case, the fibre should be indented, and in line with the declaration of total sugars. excluded from the carbohydrate count as in Europe. In Europe, the declared carbohydrate value includes only “available carbohydrates” (excludes dietary fibre). % Daily Value for carbohydrates no longer required In favor, since total carbohydrate intake is not considered a public health concern. Does not inform the consumer, about the source of sugar: naturally occurring or added sugars. Hence, there is no indication as to whether the sugar added to a fruit yogourt, for example, comes mainly from milk and fruit or from sweetening agents. The proposed display creates confusion as it is not clear whether the % DV applies solely to total sugars or carbohydrates in general. The proposed daily value of 100 g of sugars, i.e. 20 % of the daily energy intake for a 2,000 Cal diet, appears excessive. If the % DV for total sugars is maintained, perhaps it should not appear in bold characters so it is clearer that the % applies specifically to total sugars (which are not shown in bold) rather than to the carbohydrates in general. The daily value for total sugars should preferably correspond to 10% of the daily energy value (i.e. 50 g of sugars in a 2000 Calorie diet), as proposed in March 2014 by the World Health Organization in a public consultation, not 20% (or 100 g). Manufacturers of food products intended for use as ingredients in the manufacture other foods to be sold at the retail level should be required to provide with accuracy the amount of added sugar to their products, so their clients can determine the added sugar content of their finished products. Introduces the concept of naturally occurring sugars versus added sugars. May increase consumers awareness regarding the significant proportion of sugars added to food products, and can help them make better food choices. Could incite food manufacturers in reformulating their products to reduce the sugar content, thus contributing to an improved nutritional offering on the market. Laboratory nutritional analyses can generally not differentiate naturally occurring versus added sugars. For database analyses, it may be difficult to obtain accurate added sugar content from foreign ingredient vendors. For some manufacturers, this would highlight an element with bad press, and could contribute to reduced sales. A margin of error of 20% should cover inaccuracies to the added sugars content of multi-ingredient food products. Improved grouping of nutrients helps consumers understand that the indented nutrients are components of fat or carbohydrates. De-clutters the NFT, and improves legibility of the information. potassium and vitamin D intakes appear inadequate for a significant proportion of the Canadian population. An adequate dietary intake of potassium (4.7 g per day for adults) should contribute to lower blood pressure levels, reduce the risk of recurrent kidney stones, and possibly decrease bone loss. Vitamin D helps build strong bones and teeth. Considering the prevalence of osteoporosis in Canada, an inadequate intake of vitamin D is a public health concern. Involves an additional expense for manufacturers who must reanalyze the nutritional composition of their food products. Consistent with the manner of declaring other nutrients. May be useful for the management of dietary intake, especially for those who consume vitamin and mineral supplements. % DV indicated only for macronutrients which consumption should be limited, and for vitamins and minerals – By declaring the fibre content in grams only, consumers have no clue as to whether they are getting enough fibre or not. This is a problem as most Canadians do not consume enough fibre. The % DV for fibre should be maintained in order to help consumers identify and select sources of dietary fibre. Should greatly improve consumers’ comprehension of % DV and help them make better food choices. Voluntary declaration of bioactive compounds in a separate box Information of interest to consumers. Overall, the presentation of the NFT based on the proposed regulatory modifications should help consumers better understand the nutrition information on labels, and help them make healthier food choices. For manufacturers, these modifications involve expenses, such as the costs associated with the production of new labels and the cost of reanalyzing every product to determine its potassium and vitamin D content. Furthermore, Canadian manufacturers that export to USA also need to budget for new US labels. the removal of the declarations of vitamins A and C content. The number of servings per container would not only remain mandatory in USA, but will be required to appear in larger characters. The caloric value would be displayed in large characters, much larger than proposed in Canada. The percent daily value would be shown in a column to the left of the nutrient name, rather than to the right side as in Canada, and there would be a fine line separating the percentage column form the nutrient name column. A fine rule would separate each nutrient, as opposed to Canada that proposes to eliminate lines between total fat and saturated and trans fats, and between total carbohydrates and sugars. There is no indication explaining the % DV benchmark levels (5% DV or less is a little; 15% DV or more is a lot), as proposed in Canada. In the second proposed US NFT format, sub-headings (Quick Facts; Avoid Too Much; Get enough) would indicate which nutrients should be limited and which need to be consumed in adequate levels. To manage all the upcoming regulatory changes, food manufacturers will need to strategically plan their transition to the new labelling requirements. In another article, ACC Label will provide food for thought to make the transition work for you. Keep informed by subscribing to ACC Label’s newsletter or follow our blog at http://acclabel.com/en/category/regulatory-matters/. Health Canada and Statistics Canada. Canadian Community Health Survey Cycle 2.2, Nutrition (2004): Nutrient Intakes from Food. Provincial, Regional and National Summary Data Tables, Volume 1. 2009. Health Canada. Health Canada’s Proposed Changes to the Core Nutrients Declared in the Canadian Nutrition Facts Table, 2014. Health Canada. 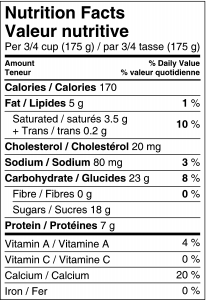 Health Canada’s Proposed Changes to the Daily Values (DVs) for Use in Nutrition Labelling in Nutrition Labelling, 2014. Health Canada. Health Canada’s Proposed Changes to the Format Requirements for the Display of Nutrition and Other Information on Food Labels, 2014. IOM (Institute of Medicine). Dietary Reference Intakes: Guiding Principles for Nutrition Labeling and Fortification, 2003. IOM (Institute of Medicine). Dietary Reference Intakes for water, potassium, sodium, chloride, and sulfate. 2005, Washington, DC: National Academies Press. IOM (Institute of Medicine), 2003. Dietary Reference Intakes: Guiding Principles for Nutrition Labeling and Fortification. Health Canada and Statistics Canada. Canadian Community Health Survey Cycle 2.2, Nutrition (2004): Nutrient Intakes from Food. Provincial, Regional and National Summary Data Tables, Volume 1. 2009. Cited 2014-04-07. Institute of Medicine, Dietary Reference Intakes for water, potassium, sodium, chloride, and sulfate. 2005, Washington, DC: National Academies Press.